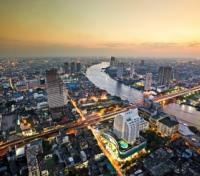 Dive headlong into the busy streets and canal-like khlongs of Bangkok on a privately guided tour. 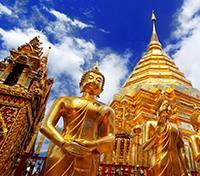 Tour ancient temples and monasteries, including Doi Suthep and Wat Suan Dok. 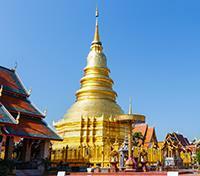 Give alms to Buddhist monks and hunt for bargains at Chiang Mai’s lively markets. 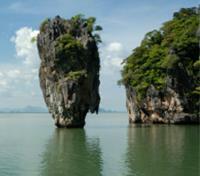 Marvel at Phang Nga Bay’s limestone karsts on a private sea canoe excursion. 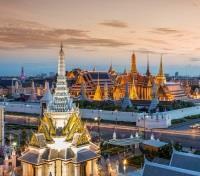 Thailand, Southeast Asia’s tropical kingdom of endless smiles, is divided into 76 provinces and three distinct states of mind. 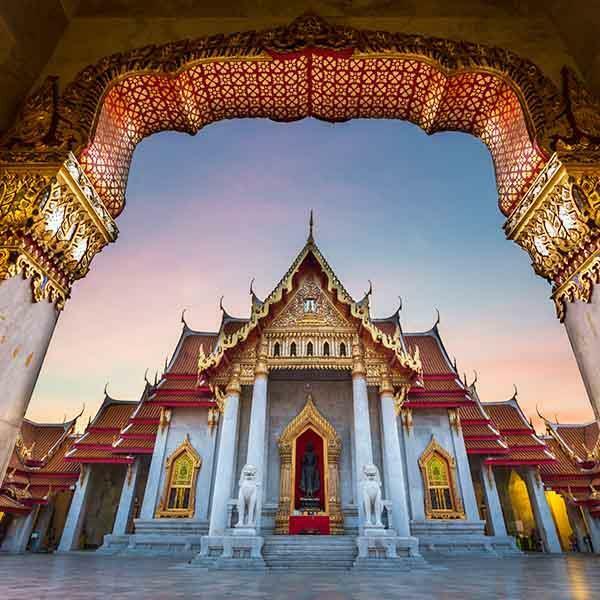 The first: “bustling,” epitomized by always-buzzing Bangkok, the vibrant southern capital seemingly held together by its steamy food carts, dazzling street life, and bewildering contrasts. 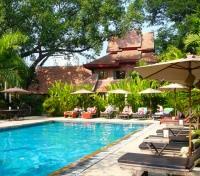 The second: “stately,” embodied by Chiang Mai, the northern capital, where ancient temples and quiet monasteries dot the skyline and the all-enveloping rainforest is just a short drive away. 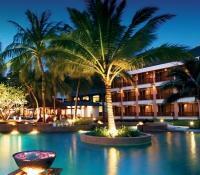 The third: “serene,” felt most strongly stretched out on the white sands of a Phuket beach at the country’s southern tip. 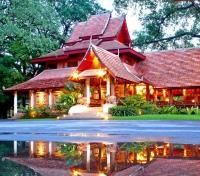 Thailand’s diversity of moods is precisely what holds it all together. Come make yourself whole. The fresh markets of Chiang Mai are at their liveliest just after dawn, as the city stirs to life and locals pop by food stalls for steaming bowls of noodles for breakfast before work. The city’s Buddhist traditional side is best witnessed early in the day, as monks in saffron-colored robes silently make their way through the sois, receiving alms for the day. Visit the Chiang Mai Gate Market early this morning with your private guide and sample some typical Thai snacks and breakfast foods. Remember, though, that you will adjourn to your hotel for a leisurely breakfast before you head back into the center of the city by songtaew as the riverfront Warorot Market stirs to life. 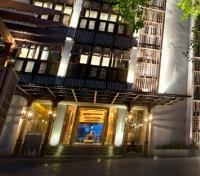 By rickshaw, or “Samlor”, visit Thapae Gate, one of the four original city gates. Chat with an English-speaking monk at a nearby temple for an insight on monastic life – they are usually very excited to practice their English skills with visitors. 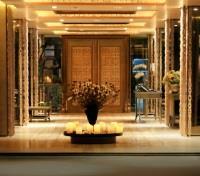 Return to your hotel for an afternoon at leisure. 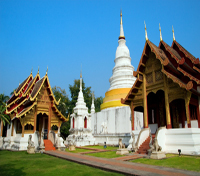 Board a flight from Chiang Mai to Phuket, with service via Bangkok. Approximate flight time is 4 hours. Phang Nga Bay offers stunning views of the sea, dotted with limestone karsts that jut out of the clear emerald-green water, and exhilarating caves carved out of the rock formations by the tides. 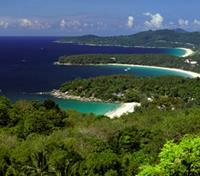 The islands in the bay are best explored by sea canoe with your private guide, avoiding the larger tourist boats. Each canoe can accommodate two guests and one guide. Paddle through the crystal clear waters around Koh Panak and Koh Hong, and explore the limestone formations and caves from the comfort of your canoe with expert safety guidance. 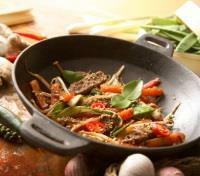 Enjoy a relaxing seafood lunch on a remote beach off the coast of Koh Hong island. After lunch, visit iconic Koh Tapu, more famously known as James Bond Island from its starring role in in the James Bond movie, “The Man with the Golden Gun”. You may find yourself wondering how the oddly shaped island doesn’t fall over as it juts vertically out of the water. 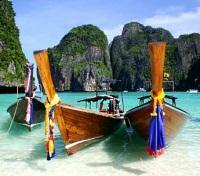 End the afternoon by exploring the coastline of Phang Nga Bay before heading back to Phuket for the evening.